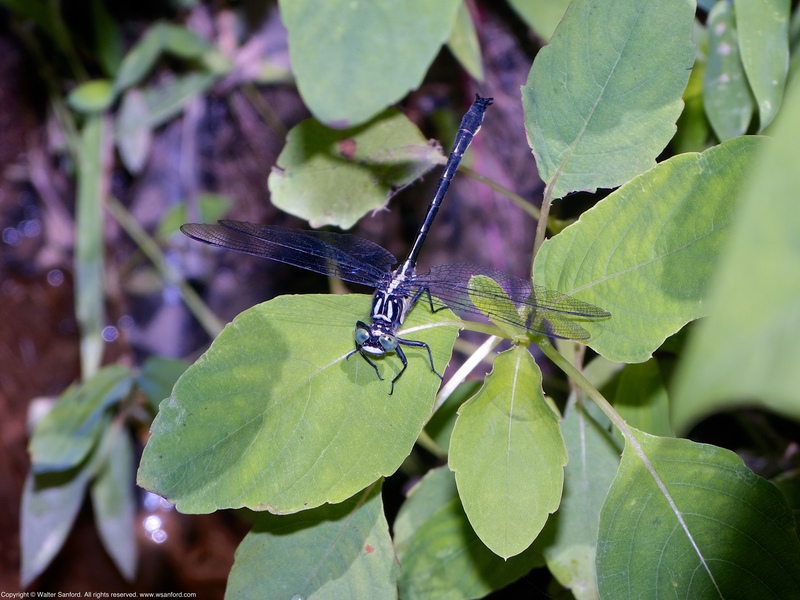 A single Sable Clubtail dragonfly (Stenogomphurus rogersi) was spotted perched alongside a small stream located in Fairfax County, Virginia USA. I nicknamed a segment of the stream “Powell’s Place” in honor of Mike Powell, my good friend and photowalking buddy, who spotted the first Sable observed at this part of the stream. “Powell’s Place” is located downstream from Hotspot No. 1, where the stream re-emerges from an underground concrete pipe. This individual is a male, as indicated by his indented hind wings and terminal appendages. 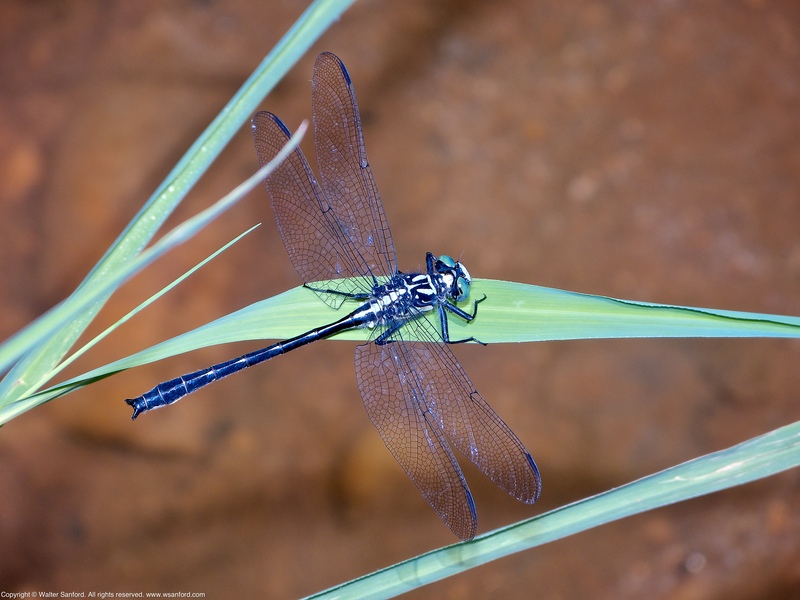 Some dragonflies tend to be creatures of habit, returning to the same spot day-after-day. Perhaps this is the same individual spotted by Mike. Who knows? I like the juxtaposition of complementary colors in the first photo. The next photo shows the dragonfly perched deep within a shaded hidey-hole. The last photo is a contender for my Odonart Portfolio. Full disclosure: Adobe Photoshop was used to removed a tiny distracting element from the bottom-right half of the preceding image (the point of a single blade of grass). This entry was posted on November 2, 2018 at 4:00 am and is filed under Aperture, Canon 580EX Speedlite, digital photography, dragonflies, natural science, Panasonic DMC-FZ150, Photoshop, wildlife photography. You can follow any responses to this entry through the RSS 2.0 feed. You can leave a response, or trackback from your own site. It’s fun to remember the carefree days earlier this year that I spent hunting for dragonflies. 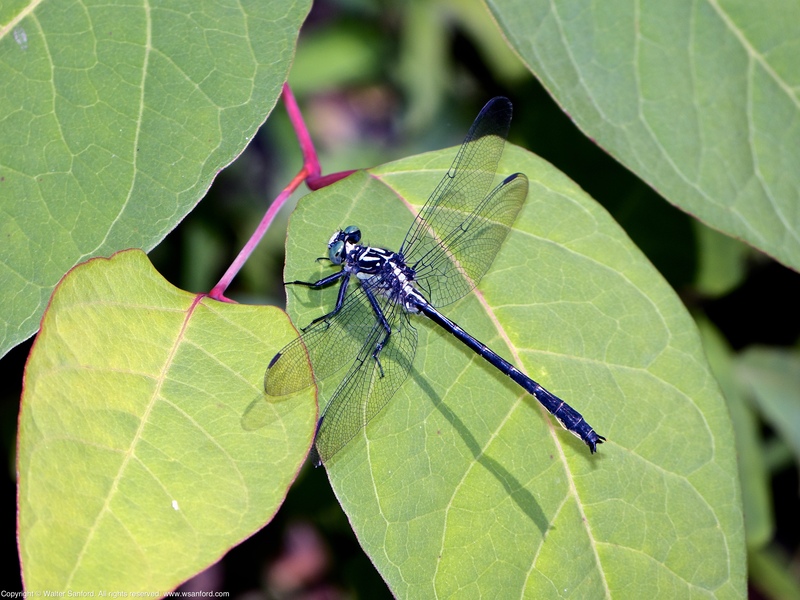 Fellow dragonfly enthusiast Walter Sanford recently did a posting about a location where I found a Sable Clubtail dragonfly, one of the rarest species in our area, a place that he christened “Powell’s Place.” Be sure to check out his posting and I encourage you also to explore his blog for some amazing photos and information about dragonflies.